Mobilicom Limited is pleased to announce it has released the MCU-mini Controller and SkyHopper ControlAir, mobile controller and receivers that allow Mobilicom to offer controlling systems to current and prospective drone and robotics customers. The Mobilicom MCU-mini Controller is a compact system comprising unified ruggedised control sticks, transceiver terminal, advanced tablet and battery pack. It also features flight control mission SW and HD low-latency video viewer application. 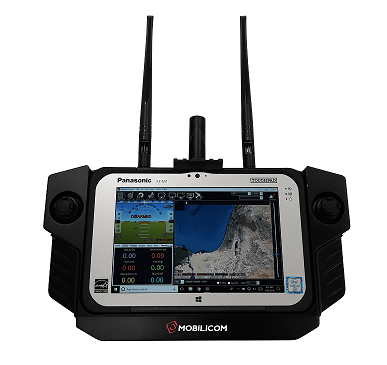 It enables transmissions to control unmanned platforms, reception of telemetry data and real-time HD video from the unmanned platforms, targeting use by enterprise and governmental sectors, offering a high-end device at a competitive price point. The SkyHopper ControlAir offers a mobile controller of drones and robotics platforms. It has a receiver terminal of telemetry data and real-time HD video, specially designed for commercial and industrial drones and robotics. It targets security and surveillance, mining and resources applications. The SkyHopper ControlAir enables controlling a drone or robotic as well as real-time viewing of video and data while operating air and ground missions. By offering a controlling terminal product, SkyHopper takes another step to become an end-to end, highend component provider for the drone market. With this addition to the SkyHopper offering the company addresses more than 50% of the drone’s overall hardware value, enabling a higher revenue potential to Mobilicom. As Mobilicom and SkyHopper services additional essential components of the drone system solution, its customers will see benefits across quality, cost and efficiency by using a single supplier to address multiple needs. SkyHopper ControlAir is the fifth product release from SkyHopper by Mobilicom, a major company objective as it continues with its aggressive first-year execution plan. In preparation for the release of these products, Mobilicom’s team demonstrated the products to select customers, establishing market anticipation. “The release of the product to both Mobilicom and SkyHopper markets extends our offering and better positions the company as a holistic end-to-end provider to the industry,” stated Mobilicom’s CEO Oren Elkayam.